Mumbai : A major fire broke out inside a 8-storey commercial complex at Andheri East in Mumbai on Wednesday morning at 10:20, however, the it's a relief that no one has been hurt in the incident. 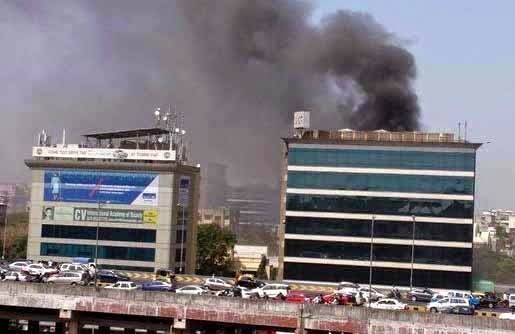 The fire broke out on the second floor of Business Point building near Western Express highway in Chakala area and was reported at 10:20 am, according to the Disaster Management Cell of the BMC. A senior fire official said that, "After receiving a call, seven fire tenders and two jumbo tankers were rushed to the site. They successfully doused the fire in two hours time." "We got a call of fire this morning and subsequently sent four fire engines and four tankers to the spot. The fire had broken out on the second floor, room no. 349, of the building," the official said. Later, the blaze was brought under control and cooling operations were underway, he said. The official said that all those present in the building were safely brought out of the premises and there was no injury in the incident.